Students have the opportunity to work in these laboratories beyond the course works. Students have the opportunity to work, one-on-one, with faculty researchers in different projects The innovative researches of faculty members are well funded by funding agencies such as: SUST University Research Centre and other Governmental/Non-governmental funding agencies. In addition, students have opportunities to conduct thesis research with participating industry, and university centers and departments. The Optical Communication Laboratory at SUST engages in research to improve the performance, dependability, and trustworthiness of telecommunications networks. The goals of the Optical Communication Laboratory are to identify, model, simulate, and demonstrate next-generation networking technologies, and to add to the knowledge base for next generation networks; to train tomorrow's network engineering innovators; and to foster industrial collaboration. Our current and recent research projects focus on Microwave photonics and optical signal processing. MWP is the field of immense interest in recent time as it is the only viable solution to meet the future need of real time ultrafast communication overcoming the bottleneck of electronics. The laboratory is equipped with a variety of computers loaded with Opti system 12.0 software. This state-of-the-art software provides the researcher with opportunity to simulate real life scenario of communication engineering in the lab. Apart from the commercial software the optical communication lab also has basic optical communication components like, LASER, photo diode, BERT, high speed oscilloscope, optical fibres, and many more small components. We are in the process of building up the practical components so that it allows us to test the simulation results. Every year students from this lab participate in national and international conferences to present their published papers on the field. A modern VLSI chip is a remarkably complex beast: billions of transistors, millions of logic gates deployed for computation and control, big blocks of memory, embedded blocks of pre-designed functions. How do people manage to design these complicated chips? Answer: a sequence of computer aided design (CAD) tools takes an abstract description of the chip, and refines it step-wise to a final design. The main focus of this teaching and research Laboratory is to make students understand to build his/her own VLSI Circuit, synthesize, verify and implement the design into the target specific device. The laboratory is equipped with high performance computers, CAD Tools: Microwind, Magic VLSI, DSCH, Altera Quartus software. The target device is Altera Cyclone II FPGA device. It comprises of two modular electric machines training kits. Each kit comprises of single and three phase transformers, various dc machines, single and three phase induction machines and a synchronous machine. Additional hardware includes power supplies with variable and fixed ac/dc, resistive, inductive and capacitive loads, rheostats, changeover switches, dynamometer loading for motors and measurement meters such as digital multimeters, wattmeters, tachometers etc. 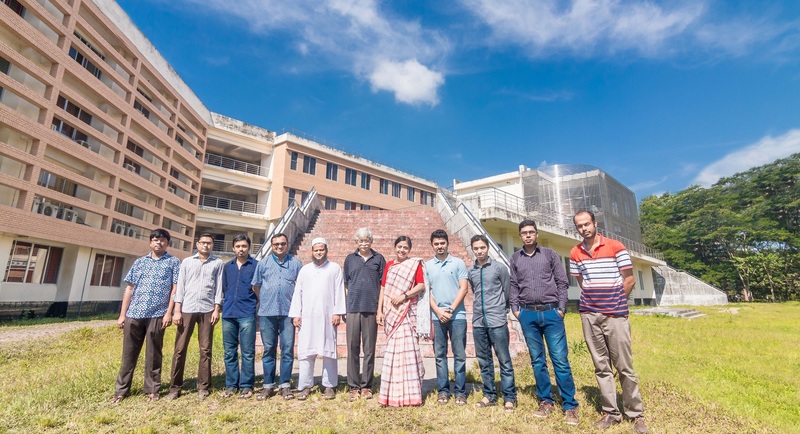 The Electric Power Systems Lab at Shahjalal University of Science and Technology is a multi-use facility for both research and educational activities. Located on the fourth floor of IICT Building, provides opportunities for faculty and graduate students to perform advanced work in the areas of AC and DC micro-grids, smart grid technologies, power electronic devices and converters. Power system Laboratory comprises of protection, simulation, high voltage and machine related experiments. Facilities are available for Current Transformer, Potential Transformer, overcurrent, undervoltege, directional, differential and distance relays including different numerical relays. Load Flow analysis, Symmetrical Faults, Unsymmetrical Faults, and Power Transmission can be analyzed in this laboratory. 1. Educate: Power system issues, especially power quality problems. It provides hands-on learning to supplement classroom theory. 3. R&D – Provides an environment for cutting edge electric power systems and technology research, prototyping, development, and demonstration. Electronics and Electrical Circuit Laboratory is a laboratory that explores the design, construction, and debugging of analog and digital electronic circuits. Laboratory research investigates the performance characteristics of Electrical AC/DC Circuits, Resonant Circuits diodes, transistors, JFETs, and op-amps, including the construction of a small audio amplifier and preamplifier. It also has the facility of Circuits and devices used for switching power converters, solid-state motor drives, and power controllers; dc-dc, ac-dc, and dc-ac converters and applications; high-power transistors. It comprises of Analog/ digital oscilloscope, analog/digital trainer board, signal generator, Voltage source and different types of multimeter. 1. Titled as “Implementation of submarine for underwater navigation and communication” has been completed successfully by a group of students under the supervision of Tuhin dev, Asst. Professor, Dept. of EEE, Mohiuddin Munna, Lecturer, Dept. of EEE. The group made it possible the submarine to communicate under the water flawlessly the distance of 3 feet. This project is funded by University Research Centre, SUST. 2. Titled as “Mini Weather Station” has been completed by another group of students under the supervision of Mehedi Hasan, Lecturer, Dept. of EEE and Biswajit Paul, Asst. Professor, Dept. of EEE. It can measure the wind speed, rain, humidity etc. This project is funded by University Research Centre, SUST.